Ever since I received my very first Kodak Brownie camera, I've been snapping photos. Every few years, I treat myself to a new one, which means the old one needs to find a new home. 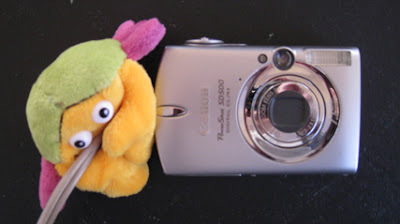 I recently purchased a Canon SD 950 IS to replace my faithful Canon SD 500, shown here with Cheeto affectionately clutching her strap. The camera is feeling lonely and miserable, and asked me to query my readers and see if anyone would like to take her in. As she pointed out, she's been all over the world and never failed to take glorious photos. (You can read a review of this truly excellent camera here). She will go to the highest bid over $100 and she comes with an extra battery and an endearing disposition. Cheeto, alas, is not included. If you are interested, email me at fleeglemail at aol dot com. Well, actually, Booties! Rubber puddlersplashers! They go perfectly with the slippers I received from Kyoko-san for my birthday. Sue, at Little Knits, supplied the yarn for stash enhancement presents. And a skein of Little Knit's own Indie II cashmere/silk. My major gift, though, may seem a bit weird for a knitter. Ever since I can remember, my crochet hook collection, inherited from a variety of ancestors, resided in the tatty case shown on the left in the photo below. The hooks are old (some of them bone and ivory), but most of them have the thin steel handles that make my hands hurt. I don't do a lot of crochet work, but when I do, I have to stop every few minutes to rest. Finishing Lyra, what with zillions of crochet chains, was a miserable experience. As of now, the old set (with a few exceptions) is on the way to Goodwill, having been replaced by the spiffy roll (courtesy of Etsy stores) shown on the right. For some reason, the makers didn't see fit to etch the needle sizes next to the appropriate holes....we'll take it to a jeweler and have it engraved. Guess I'll have the jeweler inlay some extravagant gemstones into the sterling silver surface, too. (Just kidding, Dear!). As a timely bonus, I received a Thank You gift from a friend in England. A skein of Suzanne's Sockenwolle, a little tin of hand cream, some adorable sheep stitch markers, elegant buttons, a lovely handmade shawl pin/hair stick/oil level tester (Just kidding, Hazel! ), and a handmade Russian doll pin. Stay tuned for the amazing knitted eggs, later this week. For those of you who want to get a jump-start on next year's holiday knitting, here's a cool gift! No yardage or gauge is given, but let's just assume that you'll need more than a garage-full. Cashmere would be a nice touch, don't you think? Most of my favorite bloggers have been generating an alarming quantity of knitted goods this week. I am almost embarrassed to show you what I've been doing, but figured the overproducers can snicker as they soak their aching hands in warm grits. Or whatever passes for warm grits wherever you live. I started another pair of formal socks for Roy, but as I was finished the toe increases, he decided what he really needed was a pair of mittens. No problem--a few more increases, no heel, and a thumb--and the foot covers morphed in hand covers. Or, in the case of Larry here, arm covers. I have been quite diligent about the Patons shawl. The yarn is fabulous, the colors fabulous, and the pattern is pretty fabulous too. I am also working on a strange little project that has been loosely named the International Shawl by the four participating collaborators. The concept is that each section of the shawl (center, inner border, outer border, and edging) is supposed to derive from a different country. All of us here at chez fleegle intend to have a lovely holiday and hope that all of you do too! I am sure I will have some goodies to flaunt in the next post (there are some suspiciously squashy packages in the pile...Cool! These adorable booties are the invention of a clever Dutch knitter named Saartje. They were irresistible, until I read the directions. Urk! Seams! And zillions of ends, too, whine. Note: I emailed her twice asking for permission to post this altered the pattern, but she never answered me. I tried. Note Again: Instructions are given for working on two circulars. DPN folks can easily convert to 5 sticks. Cast on 31 stitches using the Turkish cast-on--15 stitches on needle 1 and 16 stitches on needle 2. I actually just cast on 30 stitches (15 loops), then made an extra loop on the second needle to get the stitch count correct. Knit across the first needle only. You are now at the beginning of the rounds. You can place a marker, or just use the yarn dangle to indicate the beginning of the rounds. Row 1: P15, place marker (pm), P1, pm, P15 (Because the marker business falls at the beginning of the needle, I moved a few stitches from the first needle to the second so the marker wouldn't fall off and the increases didn't occur at the very beginning of the second needle). Row 19: Purl. Change color here if desired. Row 24: Knit 10, turn, cast on 10 by knitting on*, Knit 20, Purl 31, turn. Here you can see the finished cast-on stitches for the first strap. Instructions for the cast-on are at the end of this post. Row 25: Bind off 21 purlwise, cast on 10. With a crochet hook, slip-stitch in the first stitch of the row below, chain 6 (to make a button loop), and put the end of the chain loop back on the left needle. Bind off 20 stitches knitwise, 20 stitches purlwise. *To cast-on via knitting on, insert the right needle into the first stitch on the left needle, knit through it normally, but don't drop the stitch. Instead, return the loop to the left needle (1 stitch made). Insert the right needle between the first and second stitch on the left needle, knit and put the loop back on the left needle (another stitch made). Repeat 8 more times. You should have 10 new stitches on the needle and be in position to resume knitting the next row. ...are an incredible bore. Invariably, when I see a pattern I like, my eyes flow first to the bottom of the page. If I see the dreaded words "Sew seam..." or worse, "Sew seams..." I examine the pattern carefully to see if I can alter it so the last line reads: "Weave in ends." Thus, when I was bitten by the Bootie Bug and plowed through dozens of adorable patterns, all of which ended with "Sew seams...", I figured there Had To Be A Better Way. And of course there is. The techniques are adapted from my toe-up sock pattern and will work for many patterns that require endless (and useless) seaming. Any pseudobag-shaped object can be adapted to the Fleegle Seamless Method (FMS for short). For example, I have an adorable pattern for a Shaun the Sheep mobile. Every sheeplet requires at least one seam, but by applying the FMS to these objects, most of the seams are history. The two examples I will present are both booties, but once you have tried it once, FMS is obvious and you can gleefully apply it to all sorts of things. The directions given here use two circular needles, but of course DPN fans can adapt it to five sticks. Cast on 36 stitches using the Turkish cast-on. You will have 18 stitches on each needle. Knit the first needle. You are now at the beginning of the rounds. You can place a marker, or just use the yarn dangle to indicate the beginning of the rounds. Repeat these two rounds 5 more times--60 stitches, 30 on each needle. Work 10 more rounds of garter stitch--K 1 row, P 1 row. Sorry to go all Cat Bordhi on you here. This step isn't absolutely necessary, but you will find it easier to work the toe-turning business if you rearrange the stitches. We will designate the first needle as the instep needle and the second needle as the heel needle. Place a different colored marker at the beginning of the second needle (now the heel needle) to mark the beginning of rows. Move the first 12 stitches from the first (instep) needle to the heel needle. Move the last 13 stitches on the heel needle to the first (instep) needle. The instep needle should have 13 stitches, a marker, 10 stitches, a marker, 13 stitches. The heel needle has 12 stitches, the beginning-of-round marker, 12 stitches. Notice that the working yarn is in the center of the heel needle. Knit across the 12 remaining stitches on the heel needle, then knit 23 stitches on the instep needle. You are on the far side of the instep. Do not turn. continue knitting across heel needle. When you get around to the instep needle, k3 together, then knit around to beginning marker. Booties are notorious for falling off tiny feet. You can help them stay on by knitting an eyelet row, through which you can thread a ribbon, I-cord, string, rubber band, or tiny handcuffs. *k1, YO, k2 tog* repeat from * to * end. In my next post, I will give you the pattern for fleeglized Sartjee booties. These were a bit of a challenge, but they were so cute (and had so many seams and ends to weave in) that I just couldn't resist simplifying the pattern. Sherri, whom most of us know from frequenting the Loopy Ewe yarn store, is sponsoring a Random Acts of Kindness drawing. Post a RAK on her blog every Monday during the month of December and you will be eligible for a prize drawing--a $75 of Loopy Ewe goodie bag. Having delighted in all your comments, dear readers, I know that each of you probably does more than one RAK a week (leaving a comment on my blog definitely qualifies!). So please enter her drawing by posting your RAK here. In these rather unsettled times, it's also a pleasure to read some good news for a change. There are some projects that never seem to end and others that end too soon. When the final stitch of this incomparable design fell of my needles, I felt truly bereft. There will be other Nieblings in the future, assuming I can get Harry to lend me a few patterns, but I wonder if I will achieve the rapture I experienced knitting this design. For those of you who tuned in late, the yarn used was Yarn Place's inestimable Gentle (Dark Ruby) on #2.5 needles. I did not change needle size and I still cannot figure out the reference to the "binding" that is supposed to occur at the bottom of the leaves. Gentle's stretchiness probably absorbed whatever distortion might be evident with a less elastic yarn. The finished size is 52"-squareish. One word of warning about the yarn--it bled a lot. Even three rinsings with citric acid (don't care for the smell of vinegar) didn't stop the red from streaming out of the shawl. I don't really care, as both the yarn and the color were fabulous, but probably don't want to wear this over a white dress in a rainstorm. Fortunately, except for my wedding gown, I don't own a white dress and I don't think I will be getting married again any time soon. P.S. : If you decide to knit this, buy LOTS of pins for blocking!